I had the pleasure of working RFA 6 in Kansas City last week. It is always such an honor to be an integral part of the success of a promotion and a fighter. I do not take that responsibility lightly and that dedication and high level of expectation is not always understood by others. Too few people are oblivious to the details and nuances of what separates truly good cutman from merely guys with a couple cotton swabs and a towel. At times those differences in expectations may confuse a promoter, a corner, or an unaware aspiring cutman and those moments have to be dealt with carefully. The true reward is when those differences are seen clearly by others, it’s like a fresh breeze entering a room. I get to see other differences as well in my role behind the scenes. Those that prepare and those that do not, those with particular routines and those without, and those with honor and integrity that don’t care if it is seen by others. Shaky hand taping, disciplined warm up methods, corners who are prepared for every scenario (a rare observation), enthusiastic cage entries vs calm and nearly lethargic fighters prior to the bell. The simple and impressive highlight of this last show was Toby Imada, the main event fighter who showed heart in his caged battle with James Krause. He took some damage that I will make sure is handled personally in the future. After his loss I crossed paths with him as he cleaned himself up at the restroom sink. I nursed a few of his wounds but then looked down to see him cleaning his own blood drops off the floor. Nobody was around to observe, and I’ve been to hundreds of fights were the backstage area is left a mess for others to deal with. But this guy felt it important to do the little things to maintain his own level of integrity, understood by others or not. My respect for MMA rose a notch after that experience. I am excited to share that Throat Punch has decided to sponsor me for the February XFC show in Charlotte and I look forward to a great night! Check out their products and remember to Take Life By The Throat! 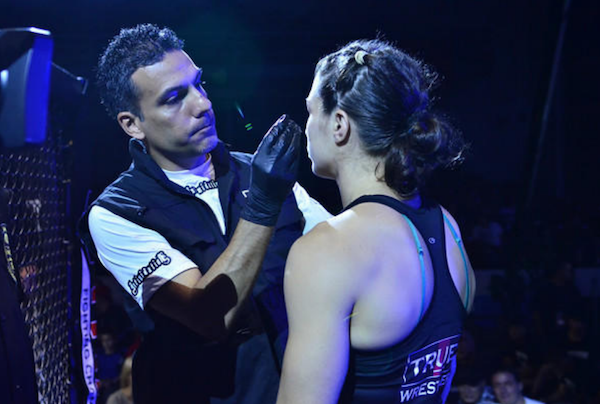 “Between Rounds” is a weekly column written by MMA cutman David Maldonado where he shares with readers his experiences and the intricate details and processes involved in his specialized field of training. Readers are encouraged to respond, interact and ask questions about the life and work of the MMA cutman. “Between Rounds” is part of ProMMAnow.com‘s ongoing series of exclusive content written by individuals involved in the mixed martial arts industry.